Commerce can be extended to add lots of new functionality. The extensions in the list below are provided by the modmore team, and are covered by our standard support. 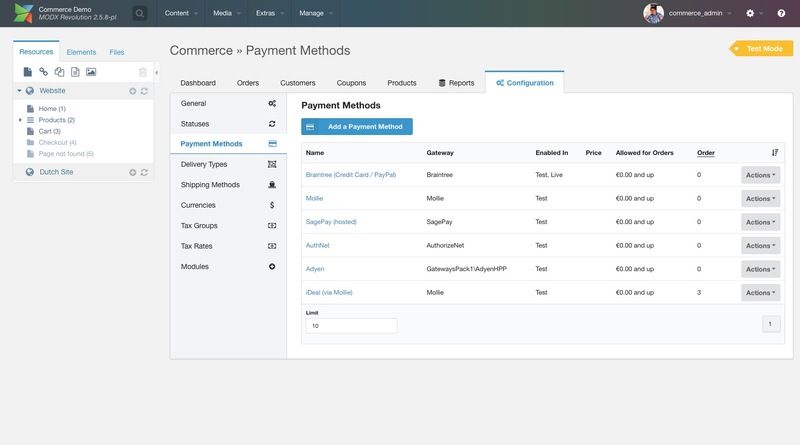 Gateways Pack #1 adds extra payment gateways to your Commerce installation. Integration of the MessageBird API for Commerce allows sending order messages via SMS. Powerful shipping method type that allows managing weight and destination based shipping fees. Adds a "Print Packing Slip" option to the order shipments table, providing a packing slip to use for fulfillment. Shipment type that automatically gives users access to a per-product defined user group on purchase. Module that provides you with a magical button that sends a customer address directly to your Dymo LabelWriter. Integrates the PDFCrowd Service with Commerce, to be used with the Invoicing feature in 1.0. Basic theme that can be used as a starter pack for a Commerce shop. Includes AJAX cart/checkout functionality, as well as login/account sections. Available soon. Commerce has a growing community of developers building extensions and modules. While these are not covered by the standard modmore support, and may not have been audited or tested by the modmore team, we recommend checking them out for even more functionality. With the Address Manager extension you can provide your customers a way to edit and delete the addresses remembered on their account. Used to give customers without an account access to view their order through either a secret link, or a combination of order number and part of their address. Provides a custom manager page that allows you to manage products, including variations and multiple languages. Allows you to manage partners and special referral links from a new tab in the Commerce dashboard. Stores the ID of resource products in the customer's user account (extended field) on purchase. Adds a print button to the order view inside Commerce. Like Packing Slip, but for the entire order. Sell resources, files and custom download methods with download limits, expirations, and more.